Feeding fish in your pond is different than feeding other types of pets, but most new fish keepers tend to treat feeding time for fish like they do other types of pets like birds, rabbits, cats, or dogs. For most of these pets you can fill a bowl and walk away, the animal will eat what it wants to eat, when it wants to eat, and you’re done. As a side note, even for those types of animals this is not the best feeding practice, nor one I recommend; but let’s face it, that is how many people handle the feeding of their pets. One thing the fish will have in common with other pets is that they will eat what they need and then they are done. If you have thrown in too much food the fish will ignore it, but then this excess food has nowhere to go, it stays in the pond. Excess food quickly breaks down and begins to drag down water quality, raise nutrient levels (which is great for algae growth), discolor water, create odors, encourage pesky flies to hang around the pond, and create maintenance for the pond owner because this food clogs filters and pump intakes. • When feeding fish, take your time, at least several minutes. Do not toss food and walk away. This feeding time lets you connect with your fish, and observe them to see how they are doing health wise. • Give small portions, let them clear ALL of it, and offer small portion again until they are slowing or not showing interest in feeding. Pay attention to how much it is they are eating so you can portion feedings if necessary. • Do not throw food out to your fish, you are teaching them to stay away from you during feeding time. Offer food close to the edge of the pond where you are standing so they associate your presence with food. You are the FOOD GOD, so work it, be it. • Try to have a “feeding station” for yourself and offer food from that area. This will also train the fish to associate your presence with the reward of food. • If you have a skimmer system on your pond (like you should), try to choose a feeding station away from the draw of the skimmer, slow water is the best feeding area. • Do not feed your fish twice as much before you go out of town, because they do not know you are going out of town and will not eat twice as much because they tomorrow they will not get fed. • If you have someone coming by to feed your fish while you are away, make sure you pre-portion the feedings for the hired care taker, and make the portions smaller than typical. • Keep in mind that fish eat different quantities of food at different times of year. How much a fish eats in May will be very different from how much they are eating in September. Adjust your feedings accordingly. • In colder climates, do not feed your fish once water temperatures have settled around 52F, the fish will not properly metabolize/digest the food and this can lead to health issues. Proper feeding habits for your pond fish will lead to happier and healthier fish with good growth rates and nicer coloration. Good feeding habits will also lead to a healthier nicer looking pond, cleaner water, and a lot less maintenance for the pond keeper. Do you have any feeding tips you want to add? Send them in! All copyrights to this material belong to Mike Gannon. I installed a pond in my backyard that is reformed and under 200 gallons. I researched what I should do and told my wife not to get any fish yet until our set up was safe for fish. My wife and my son really wanted to stock the pond so I told them to get three .17 cent goldfish from the store but not to buy anything else like Koi fish until we completed a nitrogen cycle. The next day my wife and son bought five koi fish that we’re not small for a couple hundred dollars and put them in the pond. Amongst many problems with our set up including not having proper fill filtration yet, there are two things I need your advice with. My son turns off the power to both filters so that he can see the fish better without the waterfall and sprinkler going. He always forgets to turn it back on so this fish go hours without any filter ration until I check the pond and turn it back on. If my wifi reached the backyard, I would take a smart plug and program it to turn on every 20 minutes on a 24 hour cycle so that it is constantly switching on. Because i cant do this here I am trying to figure out a solution. I found a switch that is meant to turn and appliance on like a fan on and off throughout the day but you can’t make it just keep switching on throughout the day. Any advice? My wife and son over feed the fish to the point of absurdity. I sound like a broken record telling them anything not consumed in five minutes should be scooped out with the net but my directions are not followed. I thought about taking a pill box and feeling all seven boxes for the week each week so they can take out one days worth at a time and hiding the rest of the food. Now they just take four days worth at a time. I don’t think they are intentionally trying to disrespect me; they just have no idea about the chemistry of how this works. I thought about just letting the fish die to show them what happens when day work against the fish but that is childish. I even asked my son if he cared if the fish died and he said he loves them. How do I educate them without nagging? Is there a kid friendly resource like a video that would explain pond care to my son? If he knew why things happened and how they happened he would work with me and not (unintentionally) against me. -Barring advice on the dysfunctions Of our family dynamic, please give me any advice you have to help the situation and the koi fish. Thanks!!!! hello mike, pls how can i get the best and profitable harvest in catfish business as a starter, im about to start with 5000 fingerlings in my tapoulin fish tank. tanks Dele. Hi Mike, first year with our pond, established 10year+ pond. Never had an issue. Had a bunch of cold rain yesterday, when I went to feed the fish this morning, at least 6 have died. Others are moving slowly and taking breaths out of the water. Put in a larger pump, will this be enough? Or is there something else I should be doing? Hello Al. Murky water can typically be cleared through filtration, but if you need a little extra boost try using some beneficial bacteria cultures in your pond to aid in breaking down nutrients. Have a great pond season and check out this video of pool we converted to a pond! Just came across this post and its been a great read…we have just converted an outdoor pool (freshwater) into a pond and we have about 60 fish in different species and we seem to have an algae bloom that has turned it quite murky (we have got a couple of filters running through the old pump system and its slowly helping and some plants)….but I was wondering if there is anything further that can be done? We have started to set a feeding station as mentioned and it does seem to be enticing them to one area for food. We have a garden pond and have raised a few sets of koi and goldfish. Different issues caused us to lose fish. One being Sand Hill cranes. We used to ut a heater on our pond but the elwctric bill was too high. We put in a pond in our basement and move our fish. The outside pond is less than 3′ deep and was afraid of freezing too solid. How should I feed inside? I have a backyard water feature (about 700 gal.) with a waterfall. The filter is in line with the waterfall so the waterfall must be on when the filter is working – the pump has an 1800gph rating. Do I need to run the filter all the time? Is constant waterfall good or bad for the fish? I have 4 five inch koi, one six inch comet, and about 15 very small mixed goldfish (comets, sarasas and shubunkins). Also, there are mosquito-eaters in the pond and they are impossible to count because they blend into the pond colors. It seem that there are always very small fry swimming with the mosquito fish and I’m afraid the fish population is getting too dense. How can I be sure the pond is still healthy? hello.. I have a pond n also feed them accordingly n the notice my presence whenever i want to feed dem but then som1 told me dat paw- paw leafes is gud for them too so I wanna b sure first. I constructed a fish pond and three weeks back I introduced mature cat fish into the pond then started feeding them. Now I see many small cat fish swimming in groups with a side of about two middle human fingers joined together. Could the cat fish have reproduced within two weeks or eggs of another cat fish species have flown along into the pond? Hello. I bought a house with a pond There are approximately twenty goldfish in it. The previous owner did not feed them at all so they are very shy. I am told that this is good because they won’t get eaten by predators. I have had them for a year and have not fed them but I want to feed them occasionally. I don’t want them to depend on my feeding them because I want them to protect themselves. What do you think about occasional feeding? Should I just continue as I have or can I feed occasionally? My pond is 1/2 acre. Max depth is 5′. I stocked with 150 hybrid bluegill and 15 large mouth bass, plus hundreds of minnows. I have been feeding everyday successfully. What if I leave for a week, do I need to be concerned about the fish feeding naturally, in other words do the fish become dependent on me feeding them . I don’t actually see any of the minnows so don’t know if they survived for the other fish to eat. The pond has been there for a couple of decades. Mike, my wife and I are having a disagreement. I think I read some years ago that I should feed my fish at about the same time each day. She thinks it makes no difference when I feed them. What do you think? We have channel catfish in a dirt pond and I like to feed them in the early evening. Thanks for your help. When keeping fish in a lotus pond, should you still use a skimmer or use water snails to pick up excess food? Also, wht is the best fish to keep to make sure a lotus garden is fertile? The grand kids like to feed the pond fish here in So West Texas. We have been using bread for feed. Can you suggest anything more appetizing? Mike, one more question please. Do you think that by me purchasing two or three trained koi that they will help teach these wild juveniles to feed more freely? I plan to relocate the entire group to a 16,000 gallon pond in the near future. I was told that the monkey see, monkey do scenario is usually successful. Thanks again. 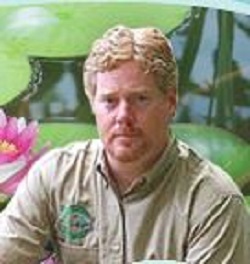 Hi Mike, I recently purchased a property that used to be fish and water gardens business. I have several ponds on the property. According to the man that owned the business 4 years ago, there were not suppose to be any koi left behind when he moved. Well there were, and I rescued ten 7″-10″ Koi two and a half weeks ago from a stagnant pond. They are currently being housed in a 935 gallon tank with a pump, filtration and waterfall. Water temp 68 degrees, ammonia 0, PH 7.6. Water is being turned over at 12 gallons per hour, which equals to a complete water change every three days. Water conditions are holding well. My question is about feeding. These koi, I would consider wild juveniles, are bundling together around a stand pipe are start turning over and over themselves when they get frightened. I’m sure they are scared and this is why they are acting like this. I have put in a feeding ring to no avail. They will not surface. Some of the bigger ones have fed on sinking shrimp and watermelon. I am worried about the smaller ones, they don’t seem to be eating yet. Should I separate the smaller ones from the larger to give them a chance to eat? I don’t want to stress them further. Or, should I just keep feeding shrimp, watermelon, earthworms, sinking pellets? What do you suggest? I am not concerned about them eating from my hand, but I would like to see that all of them are eating. When I walk away it is impossible to tell who has eaten and the smaller ones are clearly not aggressive enough and seem to be getting thinner. Please help..Thank you! My smaller koi and goldfish may not surrive the winter. I was told if they are not a certain size I should being them in?! We have several small and tiny ones. Your thoughts? Thanks! Great Blog!!?? 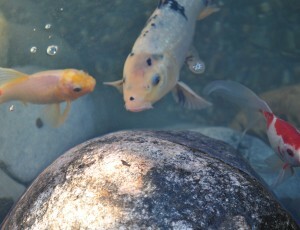 I recently setup a raised quadrant pond in our patio area, I have 9 goldfish 2″ to 5″ aprox in length. I give them an egg-cup full of food in the morning and it stays on the surface all day and evening, when I come out in the mornings the food is gone. Is this usual behaviour. i had never had any pets before, so i have no idea how many times to feed them, (especially when i know that they’re not fed during the winter) just recently notice much more baby fishes coming during the feeding time. Any advise for how often to feed them (how many times per day or week) before it freezes? should I feed my fish on maizebran and cotton seed meal? Hello Sue. I do not break up ice on a frozen pond because it will typically refreeze soon after, and the sound of breaking up ice is very stressful to fish when they are in their winter mode of torpor. I use a de-icer and an aerator (very effective!) to keep my pond oxygenated and degassed during winter months, and use this same method for the close to 200 ponds I manage with great success. I feed my fish daily during the feeding seasons, not winter, and sometimes even more often when they are in prime feeding mode. Thanks for reaching out! Interesting blog, thank you! Someone asked earlier, do you break up the ice when the pond freezes over? My pond is approx. 3 feet deep in the center. I lost two fish and a frog this past winter, it looks like the frog got stuck in the filter basket and couldn’t swim out because it was frozen near the filter. Any suggestions? Also, how many times per day do you feed? Thanks again for providing this blog! Hi Chris. I can honestly tell you that in 20+ years of professional fish keeping and as a lifelong hobbyist I have NEVER seen a fish starve to death. I hope your fish will not be the first! Be patient with your feeding, it can take some time for fish to gain the trust they need to come out and eat in your presence but eventually they will, and eventually they will associate you with food and become very excited to see you! Remember that fish do not require alot of food so if they are not eating do not give more food to try to entice them into eating, just give them time, and give your self time, the fish will come around and the hobby will become much more fun and rewarding for you AND your fish! Hi, I have just moved into a new house that has a pond. I have never kept fish before so am really new to this. I am worried that my fish are not eating. We lost 2 fish over the winter. I am not sure how the previous owner fed the fish but I have been using the same food that they left. Untill reading this post I must admit I have been feeding the fish the lazy way as in just throwing the food in and walking away. The food is still there the next day. I now know that this is bad and will start removing the excess food but if I remove the food after 5 – 10 minutes none of it will get eaten and my fish will starve? So after reading this blog I think I can summarise and deduct that as of tomorow I need to pick a feeding spot, slowly add a small amount of food and wait there for the fish to come to me? If they do not after 10 minutes I assume they are not hungry? How long can I do this for before my fish starve? It looks like we have babies (goldfish) is there any extra care I need to give them ? I do not think that would be a good idea for you pond. My friend told me about feeding fish in pond with chicken manure by building a chicken house on top of the pond so that the chicken manure will drop into the pond ready for fish food. How effective is this practice? I’ve had a pond for years and my fish fed fine . My fish died due to a very cold winter add I put in new fish but I can’t even find them. They must be hiding. How do I get them to start eating, I miss being able to feed them. Hello Todd. Thanks for commenting! I am not too sure of an exact quantity that I can recommend you feed your trout. I know that trout chow is a good food to use, and daily feeding is recommended; however I think the best amount to feed will need to be gauged by whoever does the feeding since the quantities will vary during different times of year. The green water condition your pond has can occur for various reasons and I would need more information on the pond to give any direct suggestions, but generally green water is caused by excess nutrients and those can typically be lowered through filtration, but I’d need more info to give you some real good advice. Snails are great to add to a pond to increase the diversity of organisms and the ecosystem, however; even though they eat algae I would not rely on them in any way to help keep the pond clean. If you keep them, keep them because they are fascinating creatures that will thrive in your pond. I was wondering if you have a snail, two in fact, since they eat algae, do you think overfeeding would still be a problem? I will clean but do you think it will be less trouble? Thanks for reading the blog post. If I can answer any questions for you just let me know!! i would like to lernt more on how to feed fish from the fish pond,am afarmer. Hey Lori, there is not necessarily a best time to feed your fish. I think whenever is a convenient time for you is a good time to feed! What time of the day is best to feed your fish? Thanks for reading and adding some great tips!! To avoid the feed to flow into your skimmer, an easy solution is to place an air-stone close to the skimmer and switch it on when feeding. The small waves of the air-stone avoid the feed to get in your skimmer and your fish have all the time to take it. In Holland you can buy a special plug which will be automatically switch of after 15, 30, 60 minutes or even after 2 hours.